Since 1932, McDonald Observatory has enjoyed nighttime skies as dark as any major astronomical observatory in the world. Its remote location, in the heart of the Davis Mountains of West Texas, seemed to ensure this for decades to come. With the boom in oil and gas related activities in and around the Permian Basin, and now in the greater Big Bend region, the past ten years has seen a gradual brightening, low, along the Observatory’s northern horizon. As part of its ongoing Dark Skies Initiative, the Observatory hopes to halt the rising sky-glow, and reverse the trend, by promoting dark sky friendly lighting practices for surrounding communities and, in particular, the oil and gas industry. Fortunately, the quality of recommended lighting not only helps protect the awe-inspiring night skies essential to astronomy, but also benefits the industry through cost efficiency, improved visibility on the worksite, increased worker safety, and more. 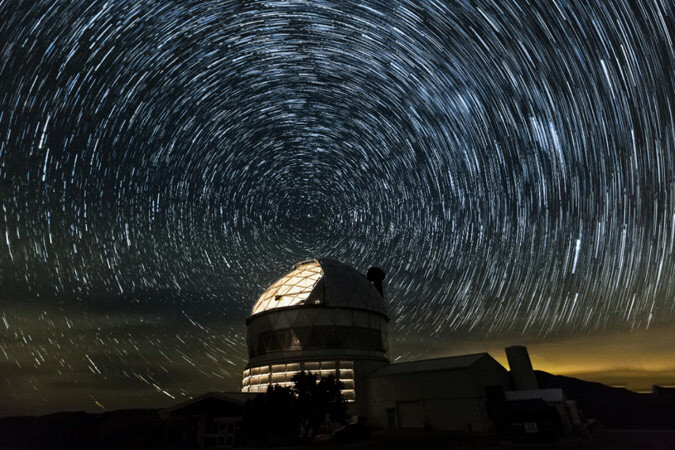 McDonald Observatory is a 500-acre satellite campus of the University of Texas at Austin. 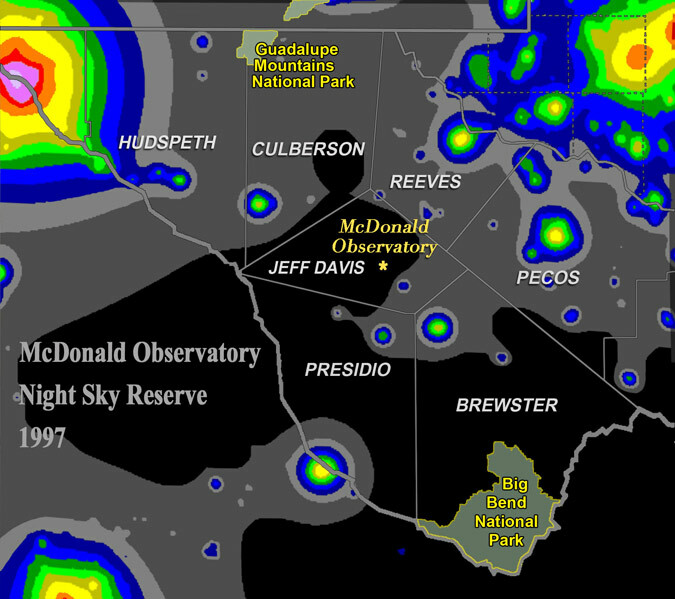 It is surrounded by seven counties, each of which have outdoor lighting ordinances intended to protect the dark night skies for ongoing astronomical research: Jeff Davis, Brewster, Presidio, Hudspeth, Culberson, Reeves, and Pecos, some 28,000 square miles in area, constituting a Night Sky Reserve. All of the cities within these counties have similar municipal ordinances. However, the Observatory regards these ordinances as vehicles for education and awareness, not enforcement. The quality of light will sell itself. The topics of dark skies, and outdoor lighting of all sorts, are especially visual. One can talk about them and read about them, but seeing is believing. Once one sees the coexistence of dark skies, and good outdoor lighting, it cannot be unseen. Toward this end, the Observatory is embarked on a campaign to help local communities, and oil and gas companies operating in the seven surrounding counties, adopt dark sky friendly lights, and be held up as best practices for all to see. 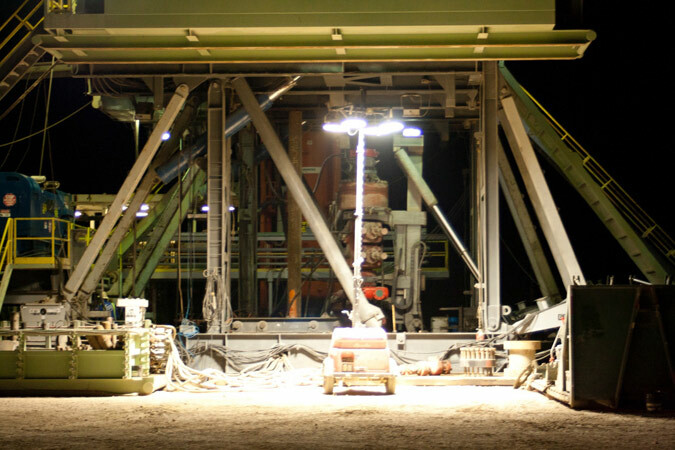 Many oil and gas operators, service companies, and vendors, including, but not limited to, Pioneer Energy Services, Apache Corporation, and Cimarex, have helped the Observatory demonstrate good lighting by making real changes to light fixtures in the field. Hundreds more companies are to follow. Many have acted in good faith, installing light fixtures they believed to be, and some were advertised as, dark sky friendly, only to learn they did not meet the criteria. In an effort to reach the widest possible audience, the Observatory partnered with the Permian Basin Petroleum Association to develop a set of Recommended Lighting Practices (RPs), published in 2017. The publication has since drawn the endorsement of the Texas Oil and Gas Association, and Apache Corporation produced a complementary video, and gifted it to the Observatory, to help address the all-important visual nature of the topic. These documents, and more, are available at the Observatory’s website. 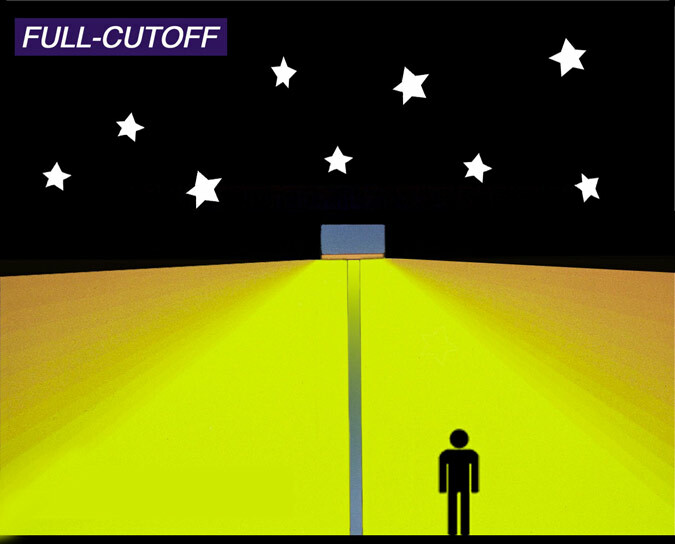 The primary concern addressed by the RPs is to keep light from shinning, wasted, directly above the horizon and into the sky, accomplished by using a light fixture type referred to as a “full-cutoff.” This is an excellent example of how important it is to visualize light distribution in addition to describing it. The Illuminating Engineering Society of North America defines full cutoff as: “The luminous intensity (in candelas) at or above an angle of 90° above nadir is zero, and the luminous intensity (in candelas) at or above a vertical angle of 80° above nadir does not numerically exceed 10 percent of the luminous flux (in lumens) of the lamp or lamps in the luminaire.” No wonder many feel obliged to hire a lighting engineer to make sense of it. And then there is the above, Exhibit 3, a visual depiction of the same. The next step for the McDonald Observatory’s Dark Skies Initiative is to train the appropriate staff in individual oil and gas related companies to recognize dark sky friendly fixtures when they see them in the field, and when spec sheets for light fixtures cross their desks. 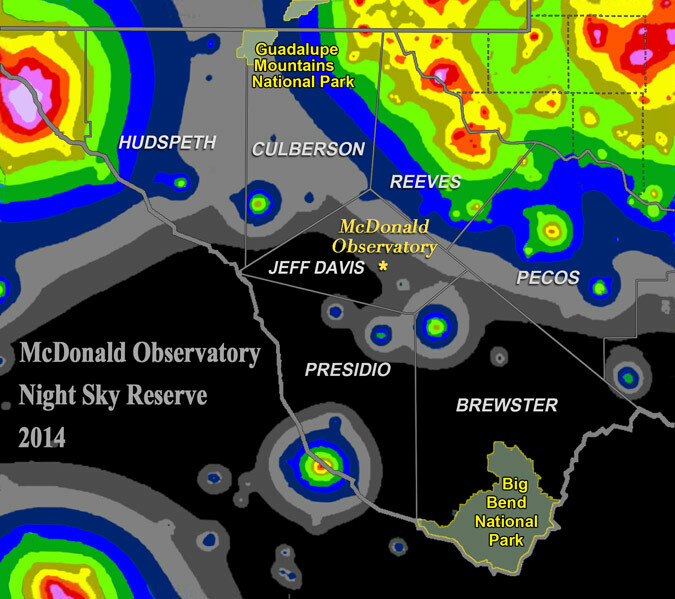 As the benefits to the industry of dark sky friendly lighting practices are recognized, more companies will adopt them, extending beyond the area near the Observatory and the Permian Basin. A true win-win for our landowners, natural resources, communities, scientific researchers, visitors to the area, and the energy industry. Bill Wren has been fascinated by the night sky all his life. In 1990, Bill joined the McDonald Observatory as public affairs specialist and researcher. He currently serves as special assistant to the superintendent at the observatory. Throughout his career at McDonald Observatory, Bill has been deeply involved in protecting the observatory’s dark night skies, an endeavor which remains a large part of his duties. He has also helped design and build several unique telescopes for public use at the observatory’s visitors center. His greatest satisfaction comes from conveying the wonders of the universe to the tens of thousands of people who visit the observatory each year. Wren studied philosophy and educational psychology at the University of Texas at Austin. He also audited courses in the astronomy department, and was an academic tutor for undergraduate students in astronomy.